Thomas D. Johnston in 1844 drew up an affidavit saying that he had been a merchant in Yanceyville for sixteen years. In 1852 he was one of the superintendents accepting subscriptions for stock in the new Bank of Yanceyville, of which he soon became president. In 1860 Johnston owned property valued at $161,000 and was the wealthiest man in town; as a matter of fact, only one planter in the county was richer. The Bank of Yanceyville was chartered by the General Assembly in December, 1852, under the guidance of N. M. Roan, Allen Gunn, Thomas A. [sic] Johnston, S. P. Hill, George Williamson, and Wm. Long, of Yanceyville; Samuel Watkins, M. McGehee, Nicholas M. Lewis, and N. J. Palmer, of Milton; Solomon Lea, Nicholas Thompson, and James S. Thompson, of Leasburg; and R. [sic] J. Lawson, Q. P. Watt, William D. Bethell, and Joseph D. Neal, of Lawson's Store. Among other things which the bank might do, it was authorized to issue bank notes. During the Civil War the Bank of Yanceyville made a series of "temporary loans" to the State of North Carolina "to meet liabilities of the State." A portion of the total was repaid, but it is not known whether the full debt was ever cleared. In 1871 a new bank was chartered, the Bank of Caswell, under the direction of commissioners John B. Blackwell, George Williamson, James Poteat, Thomas D. Johnston, and Thomas Bigelow. At some point either a new bank was chartered as the Bank of Yanceyville or the Bank of Caswell changed its name to Bank of Yanceyville. 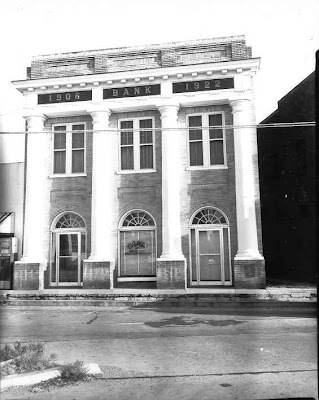 Based upon the 1906 date seen in the above photograph of the Bank of Yanceyville building in the 1960's, it is possible that what became the modern Bank of Yanceyville was chartered in 1906. Does the 1922 date represent the year in which the building was constructed? By 1870 Joseph J. Lawson, his wife Abigail, and daughter Elizabeth J. (Bettie) had moved to Danville, Pittsylvania County, Virginia, where Joseph was occupied as a tobacco trader. He apparently had survived the Civil War fairly well as he showed in the 1870 US Census real property valued at $9,000 and personal property valued at $2,000. The Lawsons apparently had a large house or operated a small hotel because the 1870 census shows a number of boarders. Of interest is twenty-year-old Thomas D. Johnston, occupation clerk, and born in North Carolina. This is believed to be the son of Thomas Donoho Johnston, Sr., one of the founders of the Bank of Yanceyville mentioned above. The Samuel Hill who signed the above Bank of Yanceyville note most likely is Samuel P. Hill, a Yanceyville lawyer. I grew up in the tri-county area where Halifax, Person, and Caswell counties meet. I literally stumbled across the weblog while attempting to locate a picture of the old Yanceyville theater. I read for over an hour! Thanks for all your hard work in putting this together. I will return again and again. 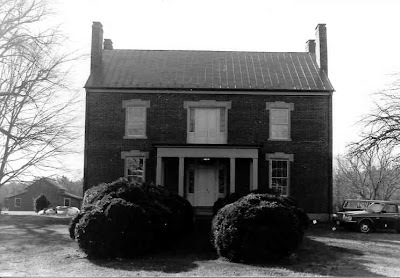 © Caswell County Historical Association. Watermark theme. Powered by Blogger.